Sometimes we stay several days in Delhi, but this time we are leaving after one day. I slept pretty well (with a little medical help). Our room at the Bon Lon Inn is quite comfortable. The fan keeps it cool enough without the A/C. The weather is very warm, but still bearable. 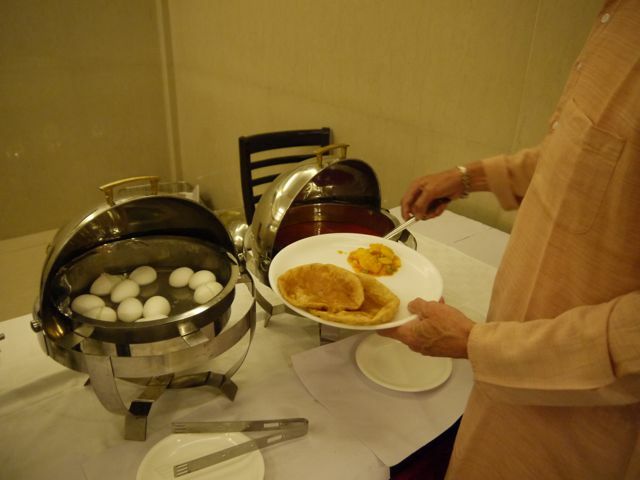 The hotel room includes a buffet breakfast. Poories, allu baji (potato curry) and hard-boiled eggs. Toast is also available, as well as juice and tea. I chopped up my egg and had egg curry with my one poori. We went out for a walk in the bazaar. 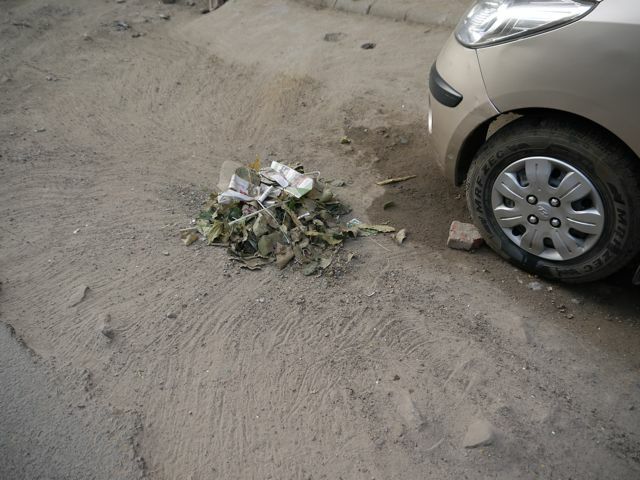 The sweepers had already been at work sweeping up debris of leaves and garbage on the sides of the streets. Someone else will come along and load this stuff into a cart and haul it away. 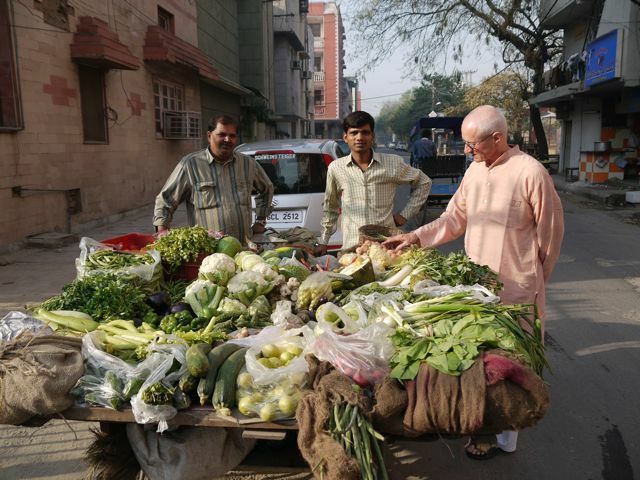 The vegetables on this cart all looked wonderful and fresh. Even broccoli was available. We made a quick late-morning trip to FabIndia where I found two nice tops to add to my collection. They are shirts that will work well both here and in the US. After noon we stopped by the Subway restaurant owned by our friend Vinay. 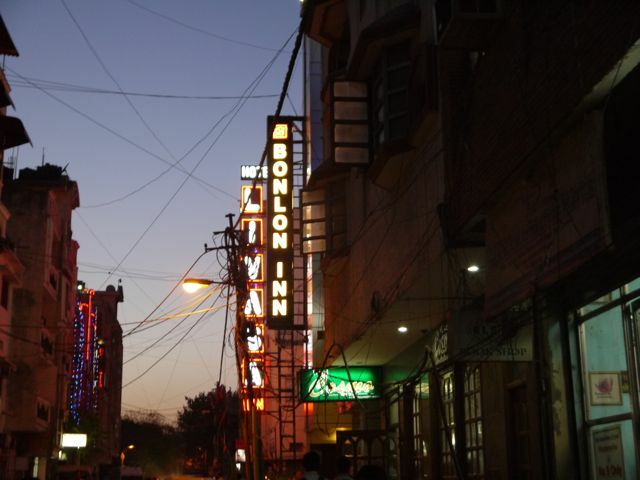 It turned out to be at the far opposite end of Karol Bagh from our hotel, so we had a good walk. He was on his way from home, so we waited and had a good visit with him. After a rest in the afternoon, we took the Metro to Janpath and the Tibetan shops to visit our old friend Doma. Her grandson Tashi now runs the shop most of the time, but she was there today. Always good to see her. Walking back to our hotel at dusk, I took this photo of the sign for our hotel. 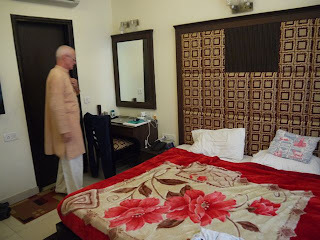 We are off on the 7 AM train to Meerut tomorrow morning.